Additional investment at the Rest and Be Thankful could be considered at the A83 task force meeting. The road between Tarbet and Campbeltown has been blighted by landslips for years and last month 3,000 tonnes of debris came down the hillside following torrential rain. A spokesman for Transport Scotland said: “We are very aware of the importance of the A83 to this region and since April 2007, £69.8million has been invested in maintaining the A83. This includes £11m in landslide mitigation measures and improvements to the Old Military Road local diversion over 2013 and 2014. “A programme of roadside catch pit works commenced in 2017 to help improve the resilience of the A83 and help keep Argyll open for business. This package is estimated at £4.4m and expected to be finished in 2020. A spokewoman for BEAR Scotland, which maintains the road, added: “Teams are continuing with repairs to the debris catch-fences above the A83 carriageway after around 3,000 tonnes of debris from multiple landslips came down the slope in October. “The debris fences were successful in preventing the majority of the material from reaching the carriageway, however some debris made it onto the A83 and Old Military Road below which required to be removed. Teams are continuing with the repair efforts to the debris fences and remaining clear-up operations in the area. “Since 2007, the road has been closed by landslides on 10 occasions. 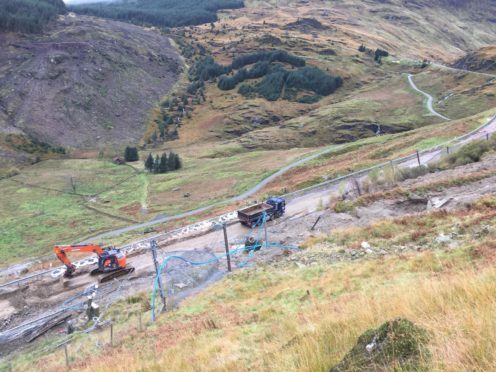 Over the past six years and prior to the most recent event in October, the range of landslip mitigation measures installed at the Rest and Be Thankful are estimated to have prevented the A83 from closing for at least 23 days in total.